This page gathers original data sets I've been using in my research papers. This data set gives the electric power consumption of a household recorded during year 2007 (with some missing days). The data set contains 349 days of recording. 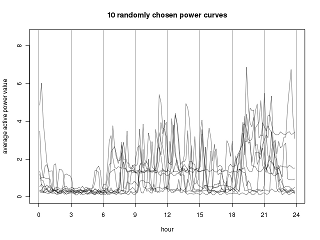 Each day is described by the active power consumption value of the household recorded at a 10 minutes sampling rate. If you use this data set, please cite the Neurocomputing paper below (Exploratory Analysis of Functional Data via Clustering and Optimal Segmentation) and include a link to the dataset location. I'll list the papers using the data upon request. 10 randomly chosen daily curves from the data set. Functional data clustering via piecewise constant nonparametric density estimation. Marc Boullé. Pattern Recognition, volume 45, number 12, pages 4389–4401, December 2012. Clustering hiérarchique non paramétrique de données fonctionnelles. Marc Boullé, Romain Guigourès and Fabrice Rossi. In Actes de la 12ème Conférence Internationale Francophone sur l'Extraction et la Gestion des Connaissances (EGC'2012), pages 101-112, Bordeaux, France, February 2012. Exploratory Analysis of Functional Data via Clustering and Optimal Segmentation. Georges Hébrail, Bernard Hugueney, Yves Lechevallier and Fabrice Rossi. Neurocomputing, volume 73, number 7-9, pages 1125-1141, March 2010. Simultaneous Clustering and Segmentation for Functional Data. Bernard Hugueney, Georges Hébrail, Yves Lechevallier and Fabrice Rossi. In Proceedings of XVIth European Symposium on Artificial Neural Networks (ESANN 2009), pages 281-286, Bruges (Belgium), April 2009.